Cyber-Imageability and the Incommensurable Future of Cities. Synapse Series edited by César Reyes Nájera for dpr-barcelona. Have you ever wondered how one can get up in the middle of the night and move in a pitch-dark room? What makes such nightly excursions possible is the development of a mental image of one’s home that tightly corresponds to the surrounding physical space. But what if one could transfer this awareness from the domestic to the urban sphere? We might then be able to navigate the city with the same confidence that characterizes our domestic movements. While checking-in, liking, sharing and going through Augmented Reality experiences we might be unconsciously contributing to the construction of a nomadic, collective awareness. 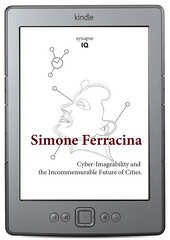 Simone Ferracina outlines in this essay what it might be like to move inside the Augmented City – a metropolis built of mixed spaces that are continually created by subjects, yet not necessarily readable to them. He describes futuristic landscapes oscillating between bits and atoms, subjectivities and algorithms, anthropocentrism and ecological networks. Welcome to the Augmented City, where you can customize the environment with electronic layers and provoke interactions that might lead to revolutions in obscure, digital autonomous zones. Update your perceptions, and don't trust the algorithms… start subverting them.